Students become captivated with the idea of survival in a post-apocalyptic world. Incorporate probing questions and informative vocabulary to create a thorough and useful experience for students. Identify the meaning of words found in the reading. Gain a raw understanding of the father-son dynamic by exploring the father's sacrifice for his son. Make predictions of the disaster that destroyed the world based on clues left by the author. Students imagine a nuclear winter is approaching and must make a plan to stock up their own bunker for survival. Discuss deviations from "proper" grammar, syntax, spelling, and punctuation used in the novel. Aligned to your State Standards and written to Bloom's Taxonomy, additional crossword, word search, comprehension quiz and answer key are also included. 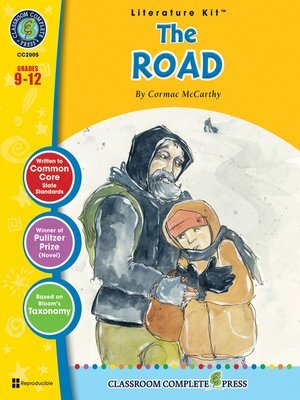 About the Novel: The Road is a Pulitzer Prize winning story about a father and son's journey through post apocalyptic America. After an unspecified disaster destroys most life on Earth, a father and son must travel across a desolate landscape in hopes of making it to the coast. Along their way, they are faced with starvation, thieves, and cannibals. The landscape is without vegetation and living animals, and is covered with ash. The sky is dark, the wind is cold, and snow falls gray. Armed only with a revolver and two rounds to protect them, the father and son set out on the road. They finally reach the sea, but the father falls ill and must prepare the son for the time when he will not be around to protect him.